I went to the KM Singapore 2011 pre-conference master class on 31 August and then the 2-day conference on 1st and 2nd September. Take a look here for a run down of the conference and video interviews with the main speakers from the social media reporter Pier Andrea Pirani. Here are presentations and other materials from the conference. The master class and conference were excellent; better than any thing I’ve seen done in Hong Kong in the knowledge management area. There were about 70 people at the master class and 180 people at the conference. The conference theme was ‘Riding the Wave of Experience’ and it built around having practical advice from people who had done things before like build intranets, how to facilitate a social media campaigns both inside and outside a big global organization, how to avoid the common traps of a knowledge management approach which has the best of intentions but so frequently fail so miserably, how to deal with organizational blindness and ignorance with even the smartest people and how to run a knowledge capture and transfer initiative. IKMS, Information & Knowledge Management Society, did a great job finding diverse speakers both from Singapore and from aboard. Throughout the conference there was good use of social media, such as an active twitter wall and video interviewing during the conference. This was the 1st time I’ve seen these kinds of social media done truly successfully at a conference. On the second day, I ran two 45-minute case clinic sessions on Creating and Running a Records Management Programme. I had done a blog posting on 25 August in preparation for this case clinic. Following is a description of what I tried to explain and some of the questions and responses. At the first session there were about 20+ people and at the second session about 10+ people. These break-out sessions were run concurrently on both the 1st and 2nd days of the conference. It was a good idea and got us away from the ‘dreaded talking heads’. I like listening to good presentations but not for a whole day. I put-up some A3 size sheets of paper on the wall and a flip charts. I learned blue-tack will hold a piece of A3 size paper to a velvet-covered wall. Here is a run-down on my ‘case clinic’. –	I believe what records management (RM) adds to the mix of knowledge management, content management, information management and library science is a way of separating the ‘useful’ from the ‘useless’. Not all knowledge is of equal value although it seems that many times this is the perspective of knowledge management; if it is offered up as ‘knowledge’ it must have long term value. The idea that some tangible piece of knowledge expires and can then be disposed is unique to RM. –	Pointed out that many times over the past 2 days we had heard people talk about ‘repositories’ full of junk, ‘repositories’ which no one used. If they used RM concepts of scheduling and expiration then these ‘repositories’ would be more useful and not full of junky and useless knowledge artifacts. o	ARMA definition longest and with an emphasis on the potentiality for a lawsuit. This is because ARMA is an U.S. dominated RM organization. Risk from lawsuits are not unique to the US. –	Used the Knowledge Wheel to explain where RM sits in KM. 2. My Riff on the Knowledge Wheel. Clearly it’s a part of Explicit Knowledge ‘Paper or Electronic, Documents, Books, Manuals, Vidoes, Audio, Databases, Systems, How to use them’ in the centre top sector. These are what I choose to call ‘knowledge artifacts’, which is taken directly from Snowden’s original ASHEN framework. –	However, to have a RM programme requires paying careful attention to the ‘Methods, Way we do it here, Routines, Processes, Standards, Teams & Crews’ in the left-hand sector. RM is always very closely connected to “how we do it at this place” so I recommend strongly you don’t try to change how they do it without having a very good idea of what is happening on the ground. –	Also, a RM programme must foster ‘Skills both physical and mental from learning, training and practicing’, from the right-hand sector. Tagging an electronic document or printing a label for a file folder, reading and using a records retention schedule, participating in an annual records day are all skills that the RM programme needs to teach and people need to learn. You will need to teach these things over and over again before people learn them: they need to become part of the mental model that people have about managing records in their organization. 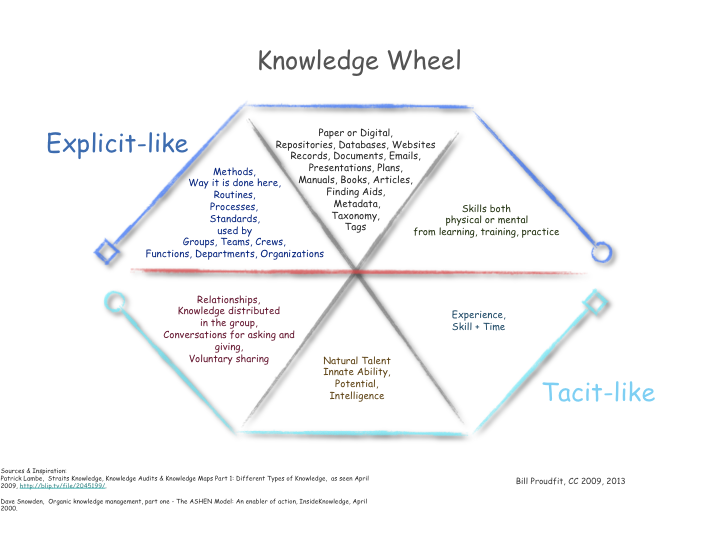 –	The RM programme gets supports from the Tacit Knowledge sectors in the bottom part of the Knowledge Wheel but it is very important to remember that records management has, at best, only an indirect role in tacit knowledge creation, sharing and use. 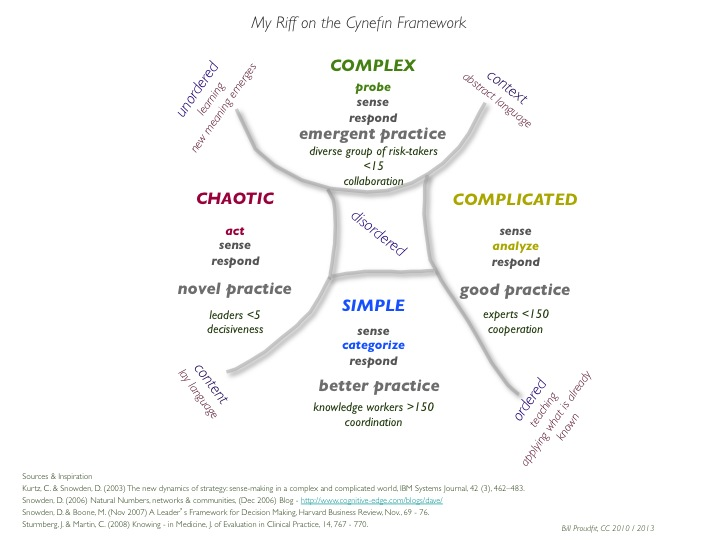 –	I place RM in the ‘Simple’ and ‘Complicated’ domains of the Cynefin Framework, see 3. My Riff on the Cynefin Framework. RM is most useful for groups with >150 members and it may be helpful for groups of experts <150. I cannot see RM being very useful in the Complex domain because the groups are small and the time frame of the decision making is likely quite short for each iteration of ‘probe, sense, respond’. In the Chaotic domain there is no time to be searching thru the knowledge artifacts, although this seems to be a favourite Hollywood film or TV script scenario; ‘get me the file, the answer is found, the disaster is averted’. Does it every really happen this way? –	Explained the letter requesting a record-keeping brief to Outside Counsel, see 4. Template Letter to Law Office on Record Keeping Brief. In-house counsel seldom does this type of legal research work. It may not be that useful to even let in-house counsel try because they are unlikely to have the skills and necessary knowledge. It is vital to specify the type, scope and purpose of the record-keeping brief. Be sure to get a quotation first and specify there will be at least 3 drafts. The final record-keeping brief must be clearly written because it would be made transparent to all employees as a supporting document for the records retention schedule. Here is an example of a records retention schedule mapped back into record-keeping briefs, see 9. Template Records Retention Schedule based on legal requirements only. –	Conduct records inventory and compile statistics on type, format, volume, and ownership and then compare these results to what people have said during the facilitation exercises. It is quite likely what they have told you is different from what you think the records inventory and statistics are telling you. –	Take the results from the record-keeping brief and the business/organizational requirements and create a Records Retention Schedule. This is an iterative process that will take several rounds. It’s important to get to the ‘first usable draft’ and then keep revising it on at least an annual basis. –	Explained the RRS TOC ~ the first 2 levels are only for navigation, see 5. Template Records Retention Schedule TOC. –	Explained the RRS Definitions – Primary Records, Temporary Records and Disposal Suspension,see 6. Template Records Retention Schedule Definitions. –	Explained they needed some high level tags/categories for the Master Records Retention Schedule, see 8. Template Master Records Retention Schedule. –	These are only useful when they can be applied consistently to a group of records that are described by use, function or purpose. This is where the more descriptive tags/categories are useful. Explained the RRS tags/classifications ~ how a classification was chosen, how it linked to the RRS 7 categories, Office of Record and the Notes which linked back to the Legal-keeping brief, see 7. Template Records Retention Schedule Master List. –	Emphasized that records are both paper and electronic and that frequently the paper records are more valuable/useful because of their organization. The ability to put different documents from disparate sources together, make notes on them, physically organize them with tabs and dividers is the real advantage of a paper file. –	Emphasized that senior management would not simply continue to buy more storage space, both hard-copy storage space in the office and off-site box storage or electronic storage archives, even if it is very cheap. Very cheap is never going to be ‘ZERO’ so it is likely that at some point you will no longer be allowed to keep adding various types of storage. –	Explained how standardized regular processes needed to become part of the ‘Way we do it here’; to apply the RRS tags/classifications to documents and file folders, move to archives as a regular process, dispose of them according to the schedule. Running records management days is a very good idea. When you run records management days it helps to recognize the amount disposed, moved to hard-copy and electronic archives by people, teams and departments. –	Telling people how many emails they have, how many electronic files in both personal storage and in departmental and team repositories, how many paper files in active office filing space and how many boxes in off-site storage would help people understand the scale and scope of the records management tasks. 1. Do we have to follow the schedule? My answer: Well, if you go thru the process of making a RRS it isn’t very practical to not follow it. There is a tendency in RM to make a policy, make a schedule and then not follow them. Therefore, the RM programme never ‘gets legs’. Also, it can be quite dangerous to the organization to have a RM programme that isn’t actively followed. 2. Most people just want to save everything. My answer: If they save everything then it becomes very difficult to find anything. If the haystack is smaller it is easier to find the needle. Remember what Patrick Lambe said in his presentation about the ‘tyranny of the collective’ and ‘mutual ignorance’. Don’t presume to know what ‘everybody’ wants to do. In my experience, if you give people a set of practices, processes, a records retention schedules then they will willingly dispose of expired records. The response was: Yes, but it is just your opinion. 3. We just want to get better search engines and save everything. My answer: Even the best search engines are not very effective with out tagging and structure around the records. 4. There are not many legal risks in Singapore involving records. My answer: I don’t think this is true. As a common law jurisdiction the ability to request records as evidence is enshrined in Singaporean law. If you sell any product then you have legal risk from records. If you work in any sort of financial services business you have legal risk from records. The response was: Yes, that’s probably true. We do sell things. 5. What do you do with email? My Answer: Get across the concept that the email does not belong to the individual. They don’t get to take it with them when they leave the organization. Be prepared to hear many reasons why ‘I can’t do this’ with my email. Restrict mailbox size. Stop the use of personal archiving ‘pst’ files, they just cause many problems in the long run. Buy and implement email archives so your MS Exchange servers are more efficient but be sure to require tagging against the RRS categories. Remember that IT people typically do not have long-term perspective; they are only looking for the quick fix to the problem right in front of them; the IT solution, buy an archive, install and fill it up. They are thinking they won’t be here when the archive is full. 6. Should we have a central group that receives all records and manages the records? My answer: It can work in a specialized situation like a law firm, court, hospital but in most organizations and businesses with a distributed work model it is not feasible or practical. 7. We cannot make people dispose of records. My answer: You can certainly encourage them. You just have to be consistent, practical, offer real solutions and help them thru the process. I use to regularly facilitate the disposal of around 40% of paper and electronic records every year. Once again, remember what Patrick Lambe said in his presentation about the ‘tyranny of the collective’ and ‘mutual ignorance’. Don’t presume to know what ‘everybody’ wants to do. In my experience, if you give people a set of practices, processes, a records retention schedules then they will willingly dispose of expired records. 8. Can we use bar-codes and RFID (radio frequency identification) on documents? My answer: Bar-coding is used for off-site hard-copy box storage in most cases. Bar-coding individual documents is only practical in those cases where the documents are very important and there needs to be a lot of control around them. I’ve done it for legal contracts. RFID could be used for boxes but I’ve never done it. Using is on individual documents is likely going to be too expensive. 9. Instead of disposing of the paper records can we scan them and keep them ‘just-in-case’ we need them? My answer: You could but the cost is huge. How are people going to find the scanned images? Creating an index, tagging structure, taxonomy is not a simple task and they need to be maintained. In the end you will have put in a lot of effort and money for something that is not very useful. People at the case clinic asked the same sort of questions about records management I’ve heard for years. This is not surprising. Records management is one part of ‘doing knowledge management’. Organizations mistakenly believe they are doing records management when they build a repository, create tagging terms and train people how to use this repository. Without the records retention schedule summarizing both legal and business/organizational requirements it is not a records management programme. Good RM processes help people find useful tangible knowledge artifacts and ensure that only those, which are truly useful, are being retained in various kinds of electronic and hard-copy repositories. I will be running a ‘Case Sharing’ called ‘Creating and Running a Records Management Programme’ as part of the KM Singapore 2011: “Riding the Wave of Experience” conference running between 31 August to 2 September. This case sharing will be on September 2nd. I created and managed records management programmes for many years. Take a look at my public LinkedIN profile for my work experience and education. I’ve prepared some background material about ‘Creating and Running a Records Management Programme’ in this posting and other postings on this blog. If you are interested in attending the case sharing I recommend you read this post before the event. Think about the questions, concerns, problems, issues on the topic of ‘Creating and Running a Records Management Programme’. At the case sharing, I will facilitate a group discussion to share our knowledge on the questions, concerns and problems that people bring along. Just to be clear, I’m not going to give a ‘presentation’ on the topic. To start I want to define ‘record’. You will always come back to your definition of ‘record’ when you are rolling out and managing a records management programme. People will frequently ask ‘what is a record’? Here are three definitions of “record”. All of them are good. The first is a short definition that could be found in a policy statement. It is short and says what a record is and what a record is not at this particular organization. The second definition is from the ISO 15489 Standard ‘Information and documentation – Records management Part 1’. It is short and says what a record is with an emphasis on legality and transactional value. The third definition is from the Association of Records Managers and Administrators. It is the longest and specifies both the physical format and that copies of records are included and it emphasizes the importance of records as evidence of activities and the risk of possible lawsuits. A “record” is information in any form or medium that is within the organization’s control and relates to the organization’s activity or business. This includes both electronic and hardcopy information and other tangible items such as promotional materials. Recorded information that is personal and not related to the organization’s business is not a record under this Policy. When there’s a lawsuit, all of these – including the copies that individuals have retained and any items prematurely deleted or destroyed – may be identified as discoverable. This means they could be used against the organization in a lawsuit. I want to place records management within a knowledge management framework. To start with, you should read these two posts I did in October and December 2009. I was almost finished with a MSc in Knowledge Management and I had been thinking and pondering how Content Management – CM, Information Management – IM, Knowledge Management – KM, Library Science – LS, Records Management – RM fit together. My perspective is they are all inter-related that is it difficult to do one without doing the other. Records management is about managing explicit knowledge artifacts found in the centre top of the wheel, “Paper or Electronic, Documents, Books, Manuals, Videos, Audo, Databases, Systems to Use Them”. To make a records management programme work all of the other parts of the knowledge wheel come into play. You must have a clear idea of ‘how it is done here’ and you must support the skills, learning, training and practicing required when managing records. It needs to be acknowledged and made clear that the records management programme can only indirectly change how knowledge sharing and knowledge transfer is done between people and the programme will not reduce the importance of experience. In other words, records management programmes cannot ‘make’ people share knowledge although they may make it easier to share explicit knowledge artifacts if there is a willingness to do so; nor will records management programmes make it possible to share and transfer ‘experience’ unless there is a willingness on the part of the people to do so. What I’ve noticed is that knowledge managers, information managers and technology vendors will blithely make these claims whereas an experienced records manager doesn’t even consider them to be in the realm of possibility. What is so special about Records Management? The concept that records are ‘useful’ and eventually become ‘useless’ and can be disposed is what is so special about records management. For me, this concept of ‘expiration’ and subsequent ‘disposal’ is what separates records management from knowledge management and information management. This is basically of assigning some measure of importance to the records. Those that are more important need to be retained longer. Importance is a combination of organizational/business value and legal requirements. Both are rather difficult to collect and summarize easily on records retention schedules. Recent research from TAB, a records management services and system vendor, says that 70% to 90% of hard-copy and electronic records kept at organizations over 5 years old are not required for day-to-day operational reasons. My experience with both hard-copy and electronic records confirms this is true. My rule-of-thumb is that people seldom use records that are more than 3 years old. Think about it this way; you are generally working on something that is looking towards the future and it may be useful to know what was done 12 months ago but only seldom is it useful to know what was done 24 or 36 months ago. When records are created they are ‘useful’ for some purpose. However, the records become ‘useless’ over time and they need to be disposed. Records management uses the ‘records life cycle’ concept of CREATION – USE – DISPOSAL. USE is split into ACTIVE and INACTIVE where many times INACTIVE means moving the records to some cheaper and less assessable location. Even when the records are INACTIVE they are ‘useful’. Rather frequently people think moving records to storage means they are no longer ‘useful’, which is simply wrong. Sometimes during USE the record is transferred from one format to another format; traditionally paper to microfilm, paper to scanned image and becoming more common from one electronic format to another electronic format, e.g. Microsoft WORD to PDF or PDF to TIFF. A key records management goal is to motivate people to the point of DISPOSAL. One – it makes ii much easier to find useful records if the useless record are no longer there. It is easier to find a record if you or more likely the computerized index only needs to look through 10,000 records rather than 100,000 records. Two – it protects the organization because if the ‘useless records’ are disposed they cannot be used to show what the organization was doing at that time in the past. Many times something done in the past is very difficult to explain when the social and cultural context has changed. Also, bit and pieces of records can be taken out of context to make up a story about the organization that may not be completely accurate. The organization does not need explain ‘why’ if the ‘useless records’ are disposed. The organizational/business usefulness may expire and then these ‘useless records’ may be moved to an historical archive. Remember that records in an historical archive still pose potential risk to the organization. Three – it reduces the need to re-create work already done if ‘useful’ records are created and retained for as long as they are ‘useful’ to the organization. If records are disposed while they are still ‘useful’ it can be very expensive, very difficult and perhaps practically impossible to recreate the information and knowledge contained in these records. There are real risks of having to explain past actions based on retained ‘useless records’. For example, the U.S. Tobacco Master Settlement Agreement provides for US$ 206 billion to be paid to 46 U.S. states over 25 years arguably over the past actions of the U.S. tobacco companies. Those past actions were documented in thousands of internal tobacco company records, many of which were decades old when they had to be offered up to law firms working for U.S. state attorney offices and used as evidence against the four major U.S. tobacco companies. We do not know if it was only because of these retained ‘useless records’ that the settlement was made but it seems quite likely that it was a significantly contributing factor. There are real costs if records are not created and the tacit knowledge is only held in people’s heads. There was a US$69 million cost overrun because information and knowledge was either disposed in records which should have been retained or the tacit knowledge about ‘how we do it’ was never written down about how to build a component of a Trident nuclear warhead called Fogbank, see Patrick Lambe’s blog on ‘Forgetting’ . I am not suggesting that all tacit knowledge should be written down, but I have a strong suspicion that it would not have been impossible to document the production process for the component Fogbank and retain it. The Fogbank processes are from that part of ‘The Knowledge Wheel – Methods, Way it is done here, Routines, Processes, Standards, Teams & Crews’. Why create a Records Management Programme? Create a policy document and have it approved by the most senior members of the organization. Work with the people who create and use the records to collect the organizational/business reasons to retain/dispose of records. Work with in-house and outside legal counsel to collect the legal reasons to retain/dispose of records. Create a Records Retention Schedule (RRS) template. Typically there are two kinds of RRS templates. One is a global schedule that applies across the functions or the organization. Another schedule is a department specific schedule. Each approach has advantages and disadvantages. Create and maintain RRS that summarize who/where the official records are kept, any physical format requirements, trigger dates to move to storage, to transfer to transfer to another format and to dispose of the record. Identify and implement ubiquitous tools that can apply the RRS to records and tell you when to transfer, dispose and which will track these records management activities. Hold regular records management events – training, records management days, disposal events, compliance reviews, assess and follow-up with vendors, collect what does and does not work. The purpose of the events is to ensure people know who to use the RRS for their records. Create a storage and disposal strategy for both hard-copy and electronic records – off-site/on-site – out-source/in-house. Assess on a regular basis what does and does not work and amend the programme’s RRS, processes, templates, training, events and so on. The retention schedule is a key output of the records management programme. It tells the organization how long to keep the record. It tells the organization when to dispose of the record. The actual disposal event becomes an important record for the organization to keep since it proves the records were disposed and it means people can stop looking for the disposed record. The schedule may tell the organization when to move the record to another location. Collecting the organizational/business reasons is not easy. On the ‘The Knowledge Wheel’, “Methods, Way it is done here, Routines, Processes, Standards, Teams & Crews” is where you will find these reasons. Facilitation tools that get a group of people to talk about how and why they are doing something will help elicit these reasons; knowledge café, open space technology, knowledge audit, positive deviance, future backwards are all worth considering. Remember to include and ask many people at different levels in the organization what are these reasons to retain records. The opinion of the senior manager is most likely very different from a line worker. A senior manager is likely to say ‘we don’t need this’ while a line worker will say ‘we use this every year-end to cross check the annual sales numbers’. Frequently people will say that they need to keep records for ‘legal reasons’ but it turns out their reasons were inaccurate regarding length of time and format. Collecting legal reasons for record-keeping is not easy. You can ask lawyers but the off-the-cuff response is likely to be along the lines of ‘ideally keep everything’. This is not what you or your organization wants to hear. You can ask ‘professional service firms’ and they may have some answers but my experience is they only focus on financial records and even then may miss some of the requirements. Almost always the work is going to be out-sourced to outside counsel; it is unlikely that in-house counsel have the time and/or expertise for this type of question. Take a look at this template letter with some guidance on the review process. It is very unlikely that the first and second drafts will answer the questions you need answered. I have several times had to do my own legal research and give it to outside counsel to correct the erroneous information they were giving me on length of retention, format and so on. However, the final document is very valuable when it is shared widely and summarized on a records retention schedule. You may also want to join the Yahoo Groups/LinkedIN Groups ‘Taxonomy Community of Practice’. On a records retention schedule there can be categories, which define how long to keep a record. This category is one kind of metadata that can be attached to a record. A descriptive classification is another kind of metadata which may help you find the record but it won’t help you decide how long to retain the record. These two needs to be linked together on a records retention schedule. If you come to the case sharing on 2 September I can share some of my experience with creating, maintaining and applying record retention schedules. Defines how long to keep the records. There only needs to be few of these retention categories. They must be centrally controlled and only changed if absolutely necessary. There must be a clear definition with examples and a retention period assigned to each retention category. Helps you find the records. The bold and italics terms are only for navigational purposes; the descriptive classification which is assigned to a paper folder, electronic folder or a single document is under them. There can be hundreds or even thousands of these descriptive classifications. A central control authority must exist to ensure they are being used and that they meet the requirements of the people applying them to records. If you need information and education resources about records management then the place to start is with your country’s professional records management association. Here are a few of the biggest ones in the English-speaking world to get you started.